We provide consultancy, treework (tree surgery) and landscaping services to domestic customers throughout Greater Manchester and the North West. 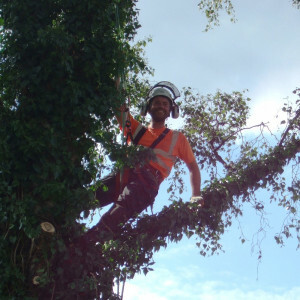 Our fully accredited trained and experienced team – led by our Arboricultural Manager Paul Hodgson – delivers gentle, sensitive and ethical services, and provides impartial advice. Paul is also our Principal Consultant, providing services such as tree safety surveys, tree surveys for homebuyers or for planning applications (BS 5837:2012). We strive to support our customers in maintaining healthy, safe and beautiful trees or shrubs on their property. We will explain what we are doing and why; and will work with you, with the aim of achieving results matching your desires and budget, whilst preserving tree health and ensuring general safety. We deliver high quality results, conform to British Standard BS 3998:2010, and will leave your site neat and tidy. We also work to the highest safety standards and are fully insured, with £5 million Public Liability cover for your peace of mind. Find out more in the ‘Why use us?’ section.